Monday August 10th 1896 I did the washing alone this morning. Will went down town. We went down again in the afternoon with a lot of marketing. I met Walter & Ida in town so did not go over the river. We did not stay late as I had a lot of evening work to do. Tuesday August 11th 1896 I ironed and baked bread in the forenoon. Will went down town. He went to the valley in the afternoon but I felt too utterly used up with the heat to attempt to go with him. Read all afternoon. 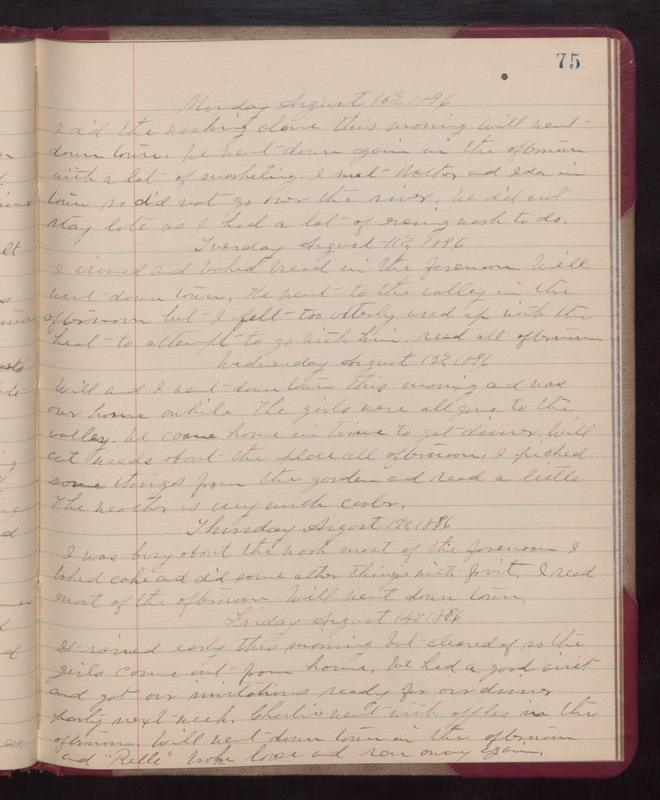 Wednesday August 12th 1896 Will and I went down town this morning and was over home awhile. The girls were all gone to the valley. We came home in time to get dinner. Will cut weeds about the place all afternoon. I picked some things from the garden and read a little. The weather is very much cooler. Thursday August 12th 1896 I was busy about the work most of the forenoon. I baked cake and did some other things with fruit. I read most of the afternoon. Will went down town. Friday August 14th 1896 It rained early this morning but cleared of so the girls came out from home. We had a good visit and got our invitations ready for our dinner party next week. Charlie went with apples in the afternoon. Will went down town in the afternoon and "Belle" broke loose and ran away again.